Hello Susan and Joan - thank you for participating in our new Local Spotlight featuring Realtors and their areas. We appreciate all the fine information you have provided for us. BG: Taxes, economic deterioration, real estate meltdown, hurricanes. We've been hearing that Florida is one of the states hit the most by problems in the last few years. But how is the real estate climate right now--is it less or more expensive for seniors to retire in Central Florida than before. In what ways is Florida retirement better or worse. S&J: The economy is certainly still an issue; but there are definite signs that things are starting to turn to the positive. Our market is up North and when people there start to sell their homes, things will get better here. Some areas up North do not have the problems Florida has and have not lost as much equity. This Fall we have already made several appointments with people finally ready to buy. We know once that cold winter weather hits up North, and knowing Florida is "on sale," they will hopefully purchase a Florida retirement dream home. Florida still has no state income taxes, and, compared to the Northeast in particular, the cost of living is favorable. Florida is a buyer’s market. There are extremely attractive real estate deals for existing, as well as new homes here in our Central Florida area. Active adult communities, such as Del Webb Orlando, offer state of the art amenities that place these over 55 communities at a competitive advantage. In Central Florida, hurricanes are typically not an issue as they are for coastal areas. BG: What are the advantages of retirement in Florida. S&J: We actually have shorts and t-shirt weather 8 months out of the year. Speaking for the Orlando area, we are not in constant fear of storms and hurricanes, and we are in an area where we can avail ourselves of typical big city sports and cultural venues of Tampa and Orlando. Numerous choices of “world class” theme parks (Disney World, Universal Studios, Sea World, and Busch Gardens) speak for themselves. All within easy driving distance from our location here in Davenport and the Orlando area in general. Speaking for ourselves personally, we have seen our grandchildren more in Florida than we did when we lived in Maryland. BG: What is it like to live year-round in Florida enjoying the climate there. S&J: You can literally enjoy golf and tennis all year. It does get hot in the summer months, especially in June through September. We treat summer weather much like the winter cold season up North. We stay out of the elements in summer. We play outdoor games, fish in the numerous lakes, power walk in the early hours, and stay in our air conditioned homes, shops, and movie theaters in the heat of the mid-day. BG: When is the ideal time to visit Florida and look at real estate there. S&J: For pleasant or perfect weather, between March and June, or between October and December. The weather during these months is simply spectacular. Real estate activity is very slow in Florida in the summer. Things pick up in the fall and traffic is pretty brisk October through March. BG: Give us a picture of how real estate is doing now in Central Florida. S&J: This summer there are signs that people up North (our main market) are beginning to sell their properties enabling them to buy their retirement home in Florida. The current market is slow right now because it is September, but we anticipate that it will pick up in the fall about now. BG: We have heard about lots of foreclosures in Florida; how many foreclosure sales are you handling and are they really better deals than buying a new or resale home. Of course, foreclosures are better deals than if you are buying new or resale, except that foreclosures are "as is" property, and there are risks involved in that. Also, foreclosures sales lower the new home sale prices. BG: Are your customers asking for foreclosures up front. S&J: I wouldn't say that--they just want a great deal. BG: Can you give us a feeling for how the economy of Central Florida is doing. Are you noticing fewer tourists. S&J: It has been slow but it seems to be picking up with the new Harry Potter attraction at Universal. Also, Disney is hiring again so that is a good sign. S&J: As mentioned earlier, things are starting to pick up here in the Orlando area. Keeping in mind that the “Active Adult Community” is a unique product, and should not necessarily be compared with other single-family housing communities. Typically, our buyer is pretty savvy. They have been around the block a time or two. Many are from management positions and know how to read a contract, and evaluate the deal. Happily, many are cash buyers, and/or have excellent credit to qualify for a mortgage. BG: what are the surrounding area amenities. S&J: There are just endless things to do. S&J: You cannot walk to shopping. BG: How far to ocean--do you go often. S&J: Living in Central Florida does not mean we do not have easy access to numerous beaches and coastal communities on either coast. We typically take day trips with friends to the west coast beaches of Clearwater and St. Pete’s Beach, areas within an easy 90-minute drive across I4. Perhaps a bit shorter drive to the east coast and areas like Cocoa Beach, as well as, Daytona Beach, a little further north--we have a huge variety of choices for a day on the beach. Interestingly, we have found that all of the dozens of beautiful white sandy beaches in these areas are easily within 75 to 90 minutes. We have become somewhat expert at beach-going, as we have all the necessary beach chairs, umbrellas, towels and coolers for snacks and beverages. We even have a 10-foot canopy for when we have more than two couples along; which lately, we routinely do. If time allowed, we would go every week; but, alas, more important and pressing things lurk…like Jerry’s golf group (Monday, Tuesday & Friday leagues), and my work for Keller Williams and the Tropical Sun Team. Even so, we try to go twice a month, if possible, in the summer months. Our beach bum group rates all beaches on a scale of 1 to 10. We rarely have gone to the same beach twice in two years. The highest rated beaches are the ones with restaurants near by, and, of course, cleanliness of the beach. We don’t like seaweed and shells to take long walks on. BG: what kinds of restaurants are in the area--and medical facilities. S&J: Heart of Florida Hospital is one mile south of Ridgewood Lakes on US Route 27. The new and growing Posner Center offers shopping and restaurants just two miles north of the main gate at Ridgewood Lakes, at US 27 and I4. There are numerous restraints up and down US 27 in either direction. I believe our area is one of the fastest growing areas in Central Florida. The area is called Orlampa along the I-4 corrider. They are going to build a high speed rail from Orlando airport with stops at Disney and Lakeland and end at Tampa airport. Also, Legoland, which is opening fall of 2011, is going to bring new jobs and tourism. It was formerly Cypress Gardens. The medical facilities and the Heart of Florida hospital are two miles from the entrance of Ridgewood Lakes. Your wide-eyed grand kids will only be a short ride away from many world-class theme parks. BG: How often do you go to Disney World - are there good and bad times to go - is there an ideal time to take the grandchildren - how much does it cost-- does it cost for a senior to go to Disney World and to take a grandchild. S&J: My husband, Jerry, works part time, one to two days a week for Disney delivering flowers for the Disney Florist. As a “cast member” Jerry can get our family and guests into the parks for free. His “Main Gate Pass” will allow him to get up to 3 guests per day into Disney with park hopper passes, 16 times a year. That is a very nice employee perk and we take advantage of it whenever we can. Florida residents do get a very nice discount at the Disney parks. The discount varies during the year depending on “peak” seasons, like major holidays, versus slow periods. Obviously, the discount is higher during slow seasons. A full- priced park hopper ticket is about $131.00. However, there are a variety of options based on multi-day passes, and, of course, seasonal promotions and discounts. Also, you can purchase “Annual Passes” which is a great option for those who plan to visit the parks frequently. BG: How are the prices in these communities - how much have they dropped since 2006. 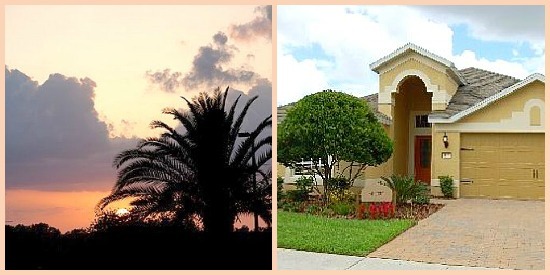 S&J: The prices are stable in Del Webb Orlando but have dropped probably 30% in High Vista. New construction is still holding its value. BG: Can people sell their homes quickly -- how long does it take to sell a home in Florida. S&J: You have to price it right to sell it and some people will not reduce their price so it will stay on the market until their price is competitive. We sold one house in DWO in 10 days and one in High Vista in 15 days because we priced them right. So the answer will vary depending on seller's motivation. BG: Do incentives help if you are trying to sell a home in Florida--what incentives are being offered in new and resale homes. S&J: Low prices are the main incentive: Prices have dropped in the general Orlando area by about 48% since 2007. BG: That does sound like a lot of incentive. Are people being realistic about the price they can get for their home. S&J: No, people are still more emotional than realistic when trying to sell. BG: Are there a lot of investors buying homes. S&J: For a period of time there were quite a few investors buying properties here. However that trend has waned a bit. BG: Do you feel there are parts of Florida that are worse or better for getting homes sold or for buying a home. S&J: Florida has been hit really hard and most of Florida is "on sale." Fort Myers and Miami have been hit really hard. BG: What other adult communities are in your area other than the ones you live in. S&J: In the immediate area there are two that could be considered competitors to Del Webb Orlando. Lake Ashton,in Lake Wales, is an active adult community about 25 miles south on route 27. Solivita, another age-restricted community, is about 20 miles to the west of Ridgewood Lakes and 21 miles south of Disney World in Poinciana. Both are fine communities with golf and active adult amenities. And there's Shea Homes in Groveland. We like to think of our community, Del Webb Orlando, at Ridgewood Lakes, to be convenient to the action for those who like the theme parks and other big-city type venues. BG: What part of Florida is the most economical to live in. S&J: Central Florida has more value then the coastal areas. The insurance, taxes and price of homes is less in the middle of the state. BG: Why would you want to live in Central Florida rather than coastal areas. S&J: First, in the coastal areas there is always fear of hurricanes. We looked in both areas, east and west coast, and found them to be very crowded. Housing prices in the coastal areas are quite a bit higher per square foot than in the central areas. So, we feel there is a better value. Many of the coastal areas are beautiful, but the value (and hurricane fear) far outweighed the aesthetics for us. BG: How is the climate in Central Florida compared to other parts of Florida. S&J: Generally, in the summer, the temperature in the coastal areas are a few degrees cooler. BG: Would you recommend renting to try out different parts of Florida for climate. S&J: Always a good idea to visit a friend, visit at the community, or rent to make sure you like a particular area. BG: Can you tell us about the equestrian part of central Florida--horse country--are there senior communities with equestrian amenities. S&J: Yes. Ocala, in Central Florida, is horse country. Del Webb Stone Creek is right in the center of horse country. Stone Creek offers the classic Del Webb amenities (golf, tennis, numerous activities and clubs). They do not offer equestrian facilities; but are in the heart of horse country in Ocala. BG: Do people live more outdoors in Florida. What outdoor recreation do seniors most like in Central Florida. S&J: Golf is probably the most frequented outdoor activity in central Florida. Of course, there is tennis, pickle ball, biking, walking, hiking, bird watching, fishing, beach going, and, of course, the theme parks. BG: Is crime a problem. Is it best for seniors to have a gated community in Florida. S&J: We feel crime is no more a problem in our area of Central Florida than it is anywhere else. Obviously, living in a gated community provides a higher level of security, than non-gated communities. It’s nice to take evening walks and move about the community freely, without worrying about crime and outsiders as much. BG: Do the foreclosures seem to be going away or are there more. When will they go away? S&J: There is less and less inventory as time goes on. There will always be foreclosures. BG: Have you seen any price appreciation anywhere--what areas. BG: Are there fewer buyers and more renters. S&J: Not for 55 plus. They are ready to buy for the most part. BG: Are rents going up. BG: Would you buy a home now in Florida, and, if so, why. S&J: I would absolutely buy a home right now in Central Florida. First, simply for the location and weather; but, also for the tremendous values available right now. BG: Would you buy a new home, resale or foreclosure in Florida. S&J: I would buy a new home because it comes with a warranty and there are no surprises. BG: How do people feel about the economy in Florida - are they hesitant about buying. S&J: I think the market is starting to turn around and people are ready to make the move. Retirees are starting to sell their homes up north and finally make things happen. Also, more and more baby boomers are retiring and there are more buyers. BG: What are Realtors doing now in Florida to get a home sold. BG: What would you suggest to people trying to sell their home in Florida. S&J: Staging and price help to make your home more competitive. BG: Are mobile homes selling--what senior mobile homes parks are in the area. S&J: Deer Creek, in Englewood, is a mobile home park that is 55 and over. I don’t know too much about the community. BG: Who is the main buyer now in Florida. Would that be first-time buyers. S&J: I would say active adults. BG: Financing: Is it hard to get a mortgage--are there any special programs for buyers. S&J: Not if you have good credit and 20% down. BG: If you have a senior client, what features do they want in a new home--what's important. S&J: Many active senior buyers wish to downsize. They want a nice kitchen, usually 2 bedrooms with a den, two baths, two-car garage, low maintenance, lanai, upgraded flooring, granite, and one story. BG: What is the average selling price in Florida? Up or down this year - how long does it take to sell a home in Florida on average. BG: Have things in real estate slowed down appreciatively since the homebuyer tax credit expired. S&J: Not really related to the tax credit. The active adult wouldn't be motivated just because of a tax credit; they are motivated by location and lifestyle. BG: What are advantages for the senior buyer of working with a Realtor specializing in active adult buyers and sellers. S&J: Because we know the area and the product, we can negotiate the best deals for our clients. BG: Do you think Florida will remain the #1 state for retirement. S&J: There’s no reason why not. No income taxes, year-round weather, extremely attractive pricing and value, and numerous active adult communities to choose from. BG:Thank you Susan and Joan for a great interview. Be sure to read Parts II and III. We are not responsible for information from third parties and make no recommendations for Realtors. Please do your own research concerning all matters or seek local Realtors and experts.